As 2017 comes to an end, I want to introduce one more upgrade to Build Alpha in its first year. As you know Build Alpha allows users to create, stress test, and even generate tradable code without ANY programming at all. 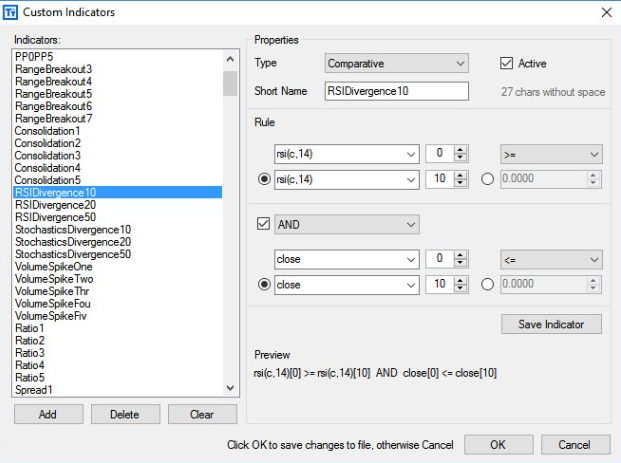 It also allows traders to use a custom drag and drop signal builder to create unique rules and signals to test alongside the pre-built Build Alpha signal library of nearly 5,000 signals – and growing (below is a picture of the drag and drop custom signal builder). 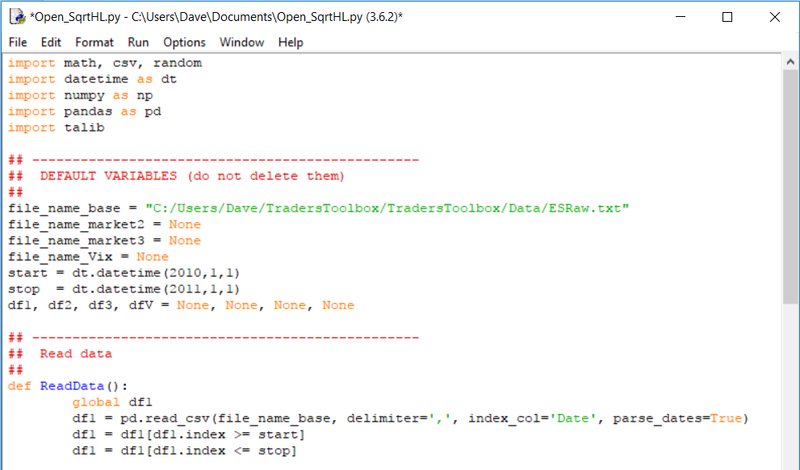 However, I have now added a python environment to give traders even more freedom. Traders now have the ability to code their own signals in python and test these signals in the Build Alpha strategy creation engine. Again, you do NOT need ANY programming skills to use Build Alpha but if you WANT to you can now use python to create signals, but you do NOT have to as Build Alpha will work without. This is just an upgrade for the more sophisticated traders out there. 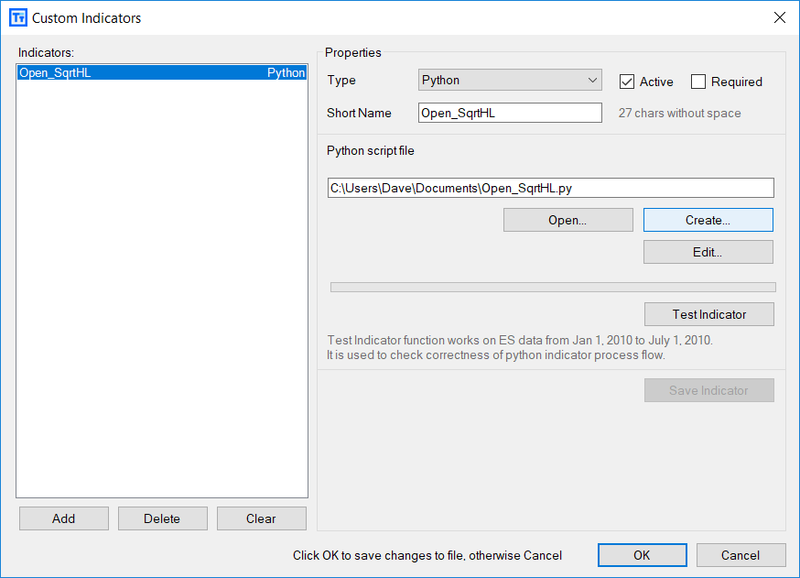 Below is a simple, 5 step walk through of how to create a simple signal using python and test it with other pre-built signals in Build Alpha. Build Alpha produces simple to use the template. All we need to change is the variable file_name_base. 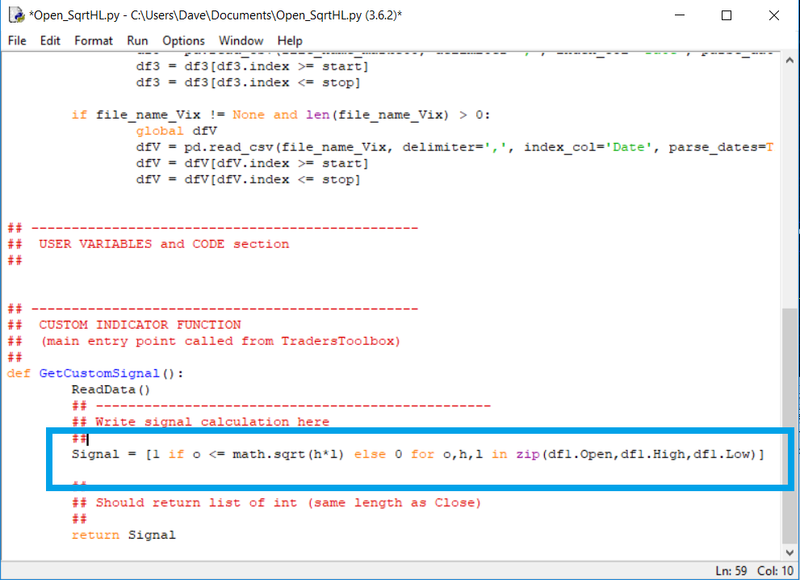 Set this variable equal to the file you wish to do analysis on. I have used the built in Build Alpha data in the example below. *Note* You can find the file path by right clicking on your data file, selecting properties, and copy/pasting the path inside two quotes. This is a simple and introductory example. I will create another post using some more advanced machine learning algorithms later on. This opens the door for what is possible in Build Alpha now. Traders can leverage the power of python as well as BuildAlpha in extremely easy to use ways. It has been one heck of a year for Build Alpha’s development and there is still so much to do in 2018! Thanks for all those that support the software; I am looking forward to next year.